The Trillium Borehole Seismometer is a very broadband seismometer designed for cased boreholes. The instrument is housed in a stainless steel enclosure with an integrated hole-lock mechanism, strain relief, and a highpressure marine grade connector. An advanced leveling system allows the instrument to self-correct over a tilt range of +/- 5 degrees. 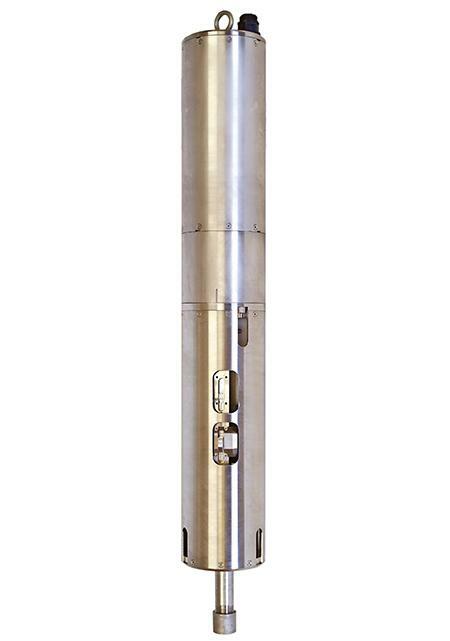 The Trillium Borehole is ideal for local, regional and tele-seismic studies having a response flat to velocity from 120 seconds to 150Hz and a self-noise below the NLNM at 100 seconds. Operators will appreciate the low power consumption, remote mass centering and robust no-mass lock design inherent in all Trillium seismometers. Automatic leveling can be remotely initiated for corrections of up to +/- 5 degrees, facilitating hole-lock installations in deep boreholes. The axis stack is mechanically levelled to ensure that the vertical axis does not couple horizontal noise. Low power consumption of 560mw minimizes power source requirements at the site. Quiet down-hole deployments benefit from the exceptional self-noise below NLNM at 100 s.